When Kavi @ Foodomania invited me to be her CWK Guest,I was very much thrilled.This was a very big surprise for me. Kavitha (Kavi) has a very fine art in cooking ,although she is a CA student but I always admired her aspiration,energy & interest in cooking at a very young age.She always cheers up through her encouraging comments.She has hosted many events and I love the post where she had mentioned the substitutes for eggs in baking,lovely post ! !She has put lot of efforts in her beautiful space.I appreciate her willingness to bring out many bloggers as guest post for her 'Cooking with Kin Series' and very happy for this very moment.When you feel happy,every one loves to celebrate it with sweets,Isn't it? And so here comes,my celebration with the Baklava Rolls ! 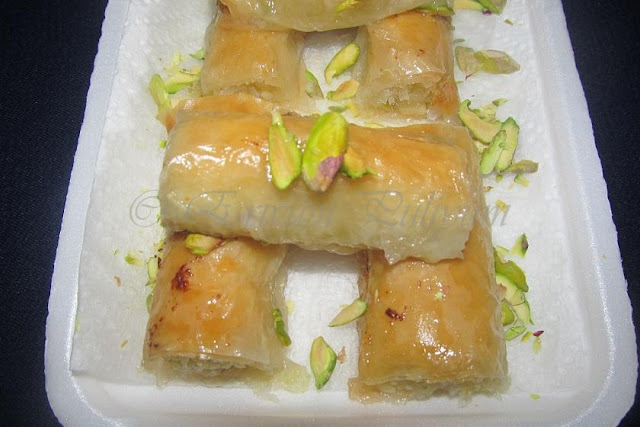 !Though Baklava is a sweet of Middle Eastern countries and it can be made in many shapes.I have used the phyllo sheets to prepare & Instead of honey,I have used sugar syrup to glaze.So,friends,enjoy these yummy rolls @ Foodomania!! wow..awesome rolls n my fav too. Lovely step by step demo! Beautiful guest post julie, perfect baklava rolls. It's vibrant and who ate them all? Lol! You have lots of them. Looks delicious. I saw it being made on Masterchef. Looks great! I love this and yours looks like the ones we get in the Arabic sweets shops here :) Nice work! Lovely bake dear, read your guest post at Kavi's..
looks fab n simply amazing yummy!!! Kavi, can you please delete my previous comment cos its an errors. thanks. Baklava rolls is one of my favorite mid eastern dessert. Booknarked with thanks. very keen to try this out. Glad to know you kavi. looks very nice. new to me..
Wow Julie, that looks awesome! Mouth watering pics! Julie! great I love this baklavas!!!! Baklava is so divine and not easy to master. Yours looks absolutely picture perfect. I can only imagine how good it tastes. wonderfull guest posts..awesome rolles..perfectly done dear..
wow..thts indeed yummy!! Loved it! looks super good.want to grab one now. Baklava is a sweet we eat a lot here in Greece and we make it a lot. 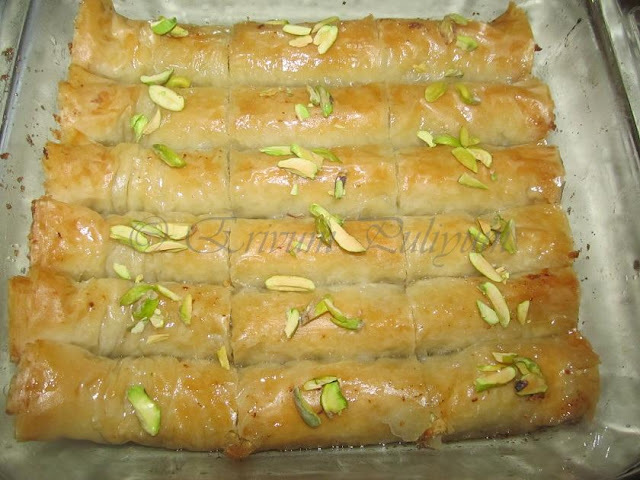 Your baklava rolls are looking totally decadent and I would love to give them a try! Looks so yummy dear. I have already seen you post. Its amazing.